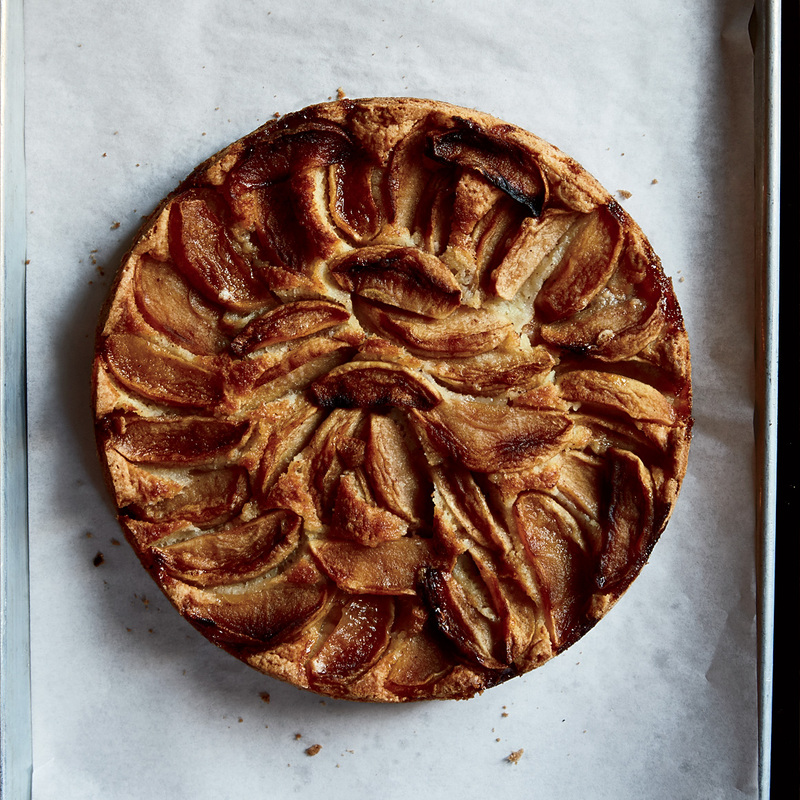 Make the cake In a large bowl, toss the apples with the Calvados, ginger, cinnamon and 2 tablespoons of the sugar. Let stand for 30 minutes. Preheat the oven to 350°. Brush a 9-inch springform pan with butter. In a large bowl, using a hand mixer, beat the 3 sticks of butter with the remaining 2 1/4 cups of sugar and the salt until pale yellow and fluffy, about 3 minutes. Beat in the eggs one at a time until smooth. Using a wooden spoon, stir in the flour and baking powder until a thick, smooth batter forms. Fold in 8 of the apple slices. Spread the batter in the prepared pan. Arrange the remaining apples in slightly overlapping concentric circles on the batter and drizzle on the apple juices. Bake for about 1 hour and 40 minutes, until a cake tester inserted in the center comes out clean. Meanwhile, make the glaze In a small saucepan, combine the sugar with 2 tablespoons of water and bring to a simmer without stirring. Cook over moderate heat, swirling the pan, until an amber caramel forms, about 4 minutes. Carefully add the cream and butter (the mixture will sputter) and cook, whisking, until the caramel is smooth, about 2 minutes. Transfer the cake to a rack and let stand for 10 minutes. Unmold the cake and brush the top with the glaze. Let cool slightly and serve warm or at room temperature. Review Body: I'm wondering if there is an error in the recipe as written - I made this cake twice today, and though I started with room temp butter, there was NO WAY I could incorporate 3 cups of flour into the batter. The first go-round, I could only add 2 cups before the batter was more of a dough. The second time around, I softened the butter a good bit more, and I could add 2.5 cups of flour, once I also added a tablespoon or two of the apple marinating liquid. I just can't fathom how one could use 3 cups of flour, as written. Baking time was at least double the 50 minutes for me. I'm not a huge fan - it's like a coffee cake, and a slightly greasy one at that, given that I couldn't add all of the flour the recipe calls for, however, my husband is in love with this cake! If I were to make it again, I'd melt at least half of the butter, which might be the secret to using all 3 cups of flour.